↑ Shan, Patrick Fuliang (2018). Yuan Shikai: A Reappraisal, The University of British Columbia Press. ISBN 9780774837781. 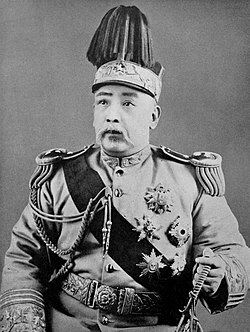 ↑ "Yuan Shikai | Qing Dynasty | International Politics". Scribd (in อังกฤษ). สืบค้นเมื่อ 2018-05-23. ↑ 4.0 4.1 Spence, Jonathan D. (1999) The Search for Modern China, W.W. Norton and Company. p. 274. ISBN 0-393-97351-4. ↑ 6.0 6.1 Busky, Donald F. (2002) Communism in History and Theory, Praeger/Greenwood. ISBN 0-275-97733-1. ↑ MAO Min (2017). The Revival of China, Volume 1. Mao Min. p. 52. ↑ Zhong Liu (2004). Thorny Road to Dignity: Surviving Mao: A Chinese Psychiatrist Embraces a Miracle in America. iUniverse. p. 97. ISBN 0595319777. ↑ Steven T. Au (1999). Beijing Odyssey: Based on the Life and Times of Liang Shiyi, a Mandarin in China's Transition from Monarchy to Republic (illustrated ed.). Mayhaven Publishing. p. 92. ISBN 1878044680. ↑ "Yuan Shikai: The leader of the Beiyang Army". China.org.cn. 18 September 2011. สืบค้นเมื่อ 22 May 2018. ↑ Zhitian Luo (30 January 2015). Inheritance within Rupture: Culture and Scholarship in Early Twentieth Century China. BRILL. pp. 19–. ISBN 978-90-04-28766-2. ↑ Tanner, Harold Miles. China: A History. Hackett Publishing (2009) ISBN 0872209156 Pages 408–410. Barnouin, Barbara and Yu Changgen. Zhou Enlai: A Political Life. Hong Kong: Chinese University of Hong Kong, 2006. p. 14 retrieved 12 March 2011. Ch'en, Jerome (1961). Yuan Shih-K'ai, 1859-1916: Brutus Assumes the Purple. London: George Allen & Unwin; Reprinted: Stanford University Press, 1971. Spence, Jonathan D. (1999). "The New Republic". The Search for Modern China. New York: W.W. Norton & Company. p. 282. หน้านี้แก้ไขล่าสุดเมื่อวันที่ 18 กุมภาพันธ์ 2562 เวลา 17:32 น.